Tesla Motors, with plans to be making 400,000 cars a year or more by 2018, is pushing suppliers to build a truly gargantuan battery cell manufacturing plant. While Tesla Motors' plan to increase Model S production to 40,000 cars a year by the end of 2014 will be good for their business, their growth may cause headaches for the battery industry. The ability (or not) for worldwide battery manufacturing capacity to grow is what will allow, or not, Tesla Motors, and other electric car manufacturing, to grow to significant levels. As we've reported recently, whether the current price for Tesla's stock, at a market cap of $20 billion, is rational depends on whether Tesla can ramp up electric car production to a level on par with medium size automakers like Audi or Peugeot. Tesla CEO Elon Musk hinted at this problem in the recent analyst conference call to discuss Q2 2013 financial results. He was asked about plans for their 3rd generation car, that's supposed to have a 200+ mile range and cost $35,000 MSRP. Tather than talk about any engineering effort going into developing the car, Musk launched into a lecture about how the scale of the plans for that car would dwarf the current production capacity for 18650 lithium-ion cells. The 85 kilowatt-hour Model S has a battery pack containing over 7,000 cells. It's thought that Model S production is 70% of the 85 kilowatt-hour version, and 30% of the 60 kilowatt-hour version. Penciling out the math means Tesla will have produced over 1.6 gigawatt-hours of battery packs during 2013 for Model S production. Doubling Model S production by the end of 2014, as is the company's plans, means producing over 3.2 gigawatt-hours of battery packs a year. Putting this another way, in June Panasonic announced they'd delivered over 100 million lithium battery cells to Tesla. That's not even enough for one year of production demand from Tesla Motors, at the current 21,000 Model S's a year rate. In January, Panasonic discussed plans to open several new factories to "increase domestic production of lithium-ion battery used for automobiles to meet robust demand in the United States" (meaning Tesla Motors). Panasonic is an investor in Tesla Motors, and has supplied the company with battery cells since the Tesla Roadster days. 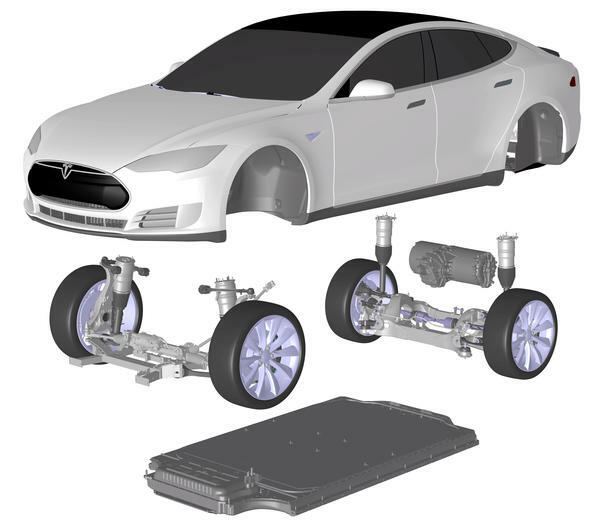 They describe the cell supplied to Tesla as an "automotive-grade lithium-ion battery cell" that the companies have collaboratively developed. In a CNBC interview a couple weeks ago, Musk said Tesla is working with not just Panasonic (their current battery supplier) but talking with other manufacturers like Samsung and LG to work out battery cell arrangements. However, he said that the current capacity of those companies, if Tesla were to consume every cell they produce, would still limit them to 200,000 cars a year. Tesla's goal is to be producing somewhere around 300-400,000 cars a year by 2018. As we noted a few days ago, reports have surfaced that Tesla and Samsung are testing battery packs in a move indicating they're nearing an agreement for Samsung to supply cells to Tesla. Musk also said they are "going through the exercise" right now to develop a “truly gargantuan battery factory of mind-boggling size.” And, surprisingly, Musk is not ruling out the possibility that Tesla will get into the business of manufacturing its own battery cells.